A year ago, a mutual friend of me and Maarja made a suggestion to surprise this lovely lady with a Stella Soomlais Design gift card as a birthday present. Today, the beautiful Maarja is roaming the streets of London with the bag on her shoulder, deciding based on the outfit she is wearing and her mood which side of the accessory to use. Maarja has many faces which are all full of surprises. The eyes of this sweet lady light up when she encounters injustice; her gracefully feminine step is replaced by a tough grip when she is winding through curves on a motorcycle; her bashful gaze becomes one of self-confidence when it is time to shine on the stage; her otherwise gentle hands clench into a fist when the situation requires assertiveness and her mellow low voice can hit even the highest notes without losing its velvety feel. Maarja wants to walk in the rain in order to be able to enjoy the sunny side of the street, the melancholic side of her gets her through the Monday blues and her passionate nature takes centre stage when she paints her lips red when she goes out. Maarja is a creative person. She expresses herself through acting on stage and on film, her outfits are always unique and her feminine make-up and styled hair catch your eye from afar. She can talk to you in different languages and slip a few dance moves into her step while walking all the while laughing from the bottom of her heart. 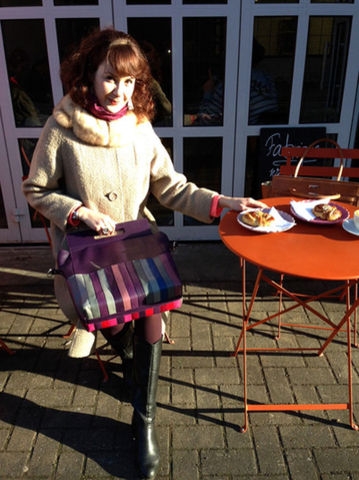 Maarja’s vibrant spirit contains a whole array of colours which is why her bag had to be able to adjust to a wide selection of moods and situations without seeming out of place. I hope that my bag does not curb but rather adds to her playfulness! Today is Maarja’s birthday. With French music playing on the background, I am sending virtual kisses, warm hugs and only the best of wishes to this mademoiselle in London! Happy birthday, dear sweet Maarja! And many thanks to all the friends who contributed to the gift! A deep bow and kisses on the cheeks from me. Special thanks to Tuuli Luik for capturing Maarja in the streets of London!